We all know the dull headache that comes when the city announces impending plans for a sewer repair or a road extension project. In advance, we anticipate the congestion caused by the heavy equipment which will crowd the cars to the margins of the streets. The sight of earthmovers plying their trade on our public thoroughfares does not draw a second glance. But that is there, in the States – back home, where energy is abundant and affordable, where mechanical power has for scores of years replaced human power. 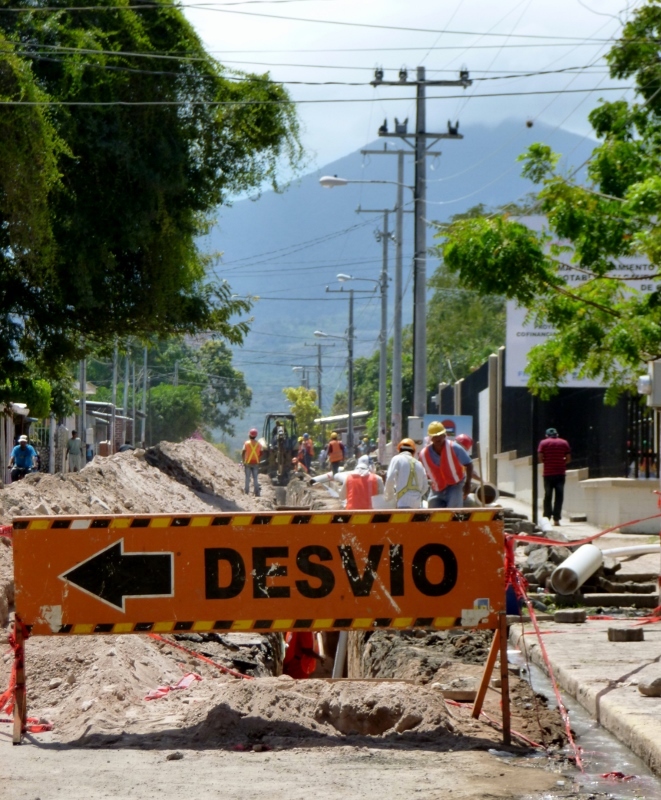 For the last two-plus months, during our daily commute, we have watched a major sewer expansion project as the City of Granada extends the sewer lines into the previously ignored and poorer barrios south of the city. Electrical power has recently been provided to the vast majority of the area along with potable water. 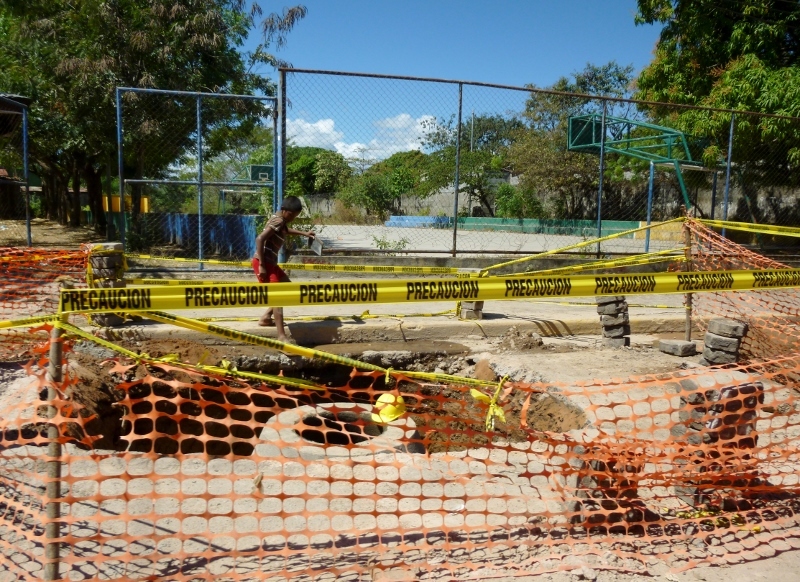 The sewer, as the most complex of the projects, is the latest improvement. 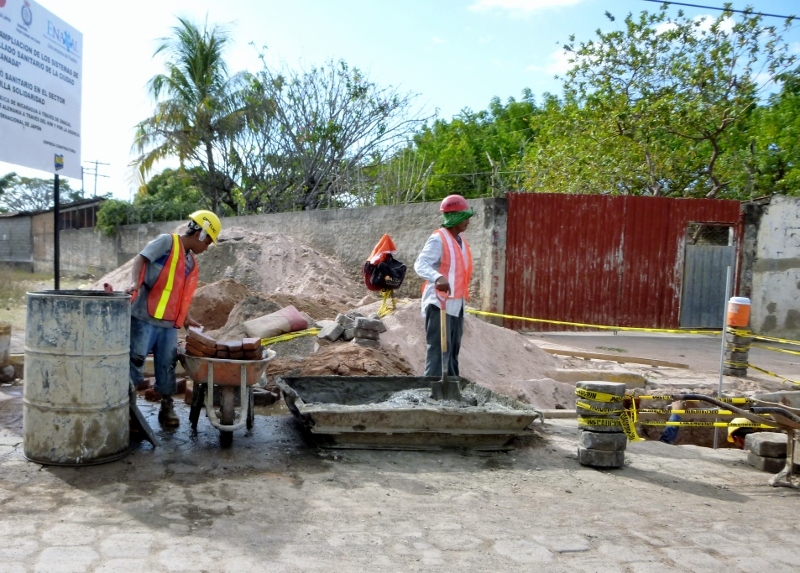 So, if you need to construct a new sewer line and you do not have access to cheap, reliable electricity or heavy equipment, you use the resources that are available to you. 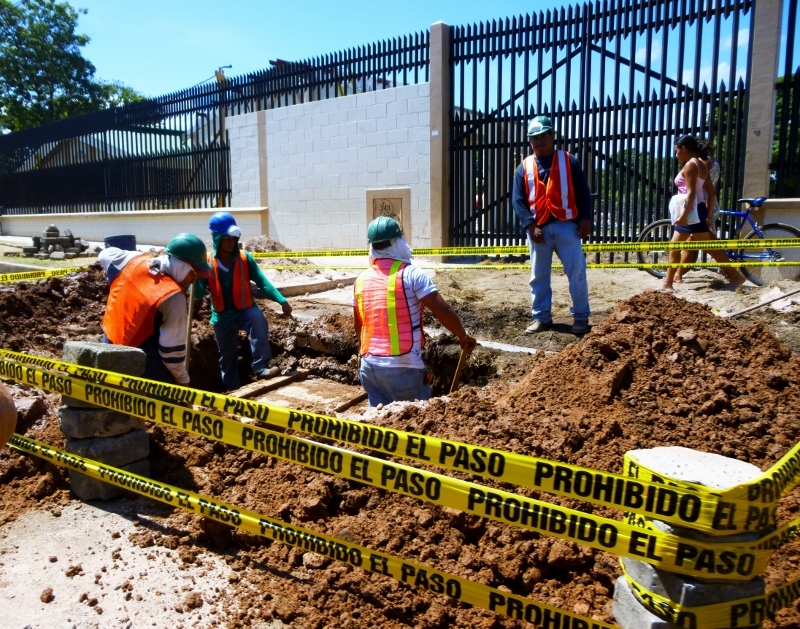 You use the labor force to dig the trenches, lay the pipe, install the man-hole connections and complete all the ancillary work that needs to be done. Now, mechanized power is not totally absent. There are trucks delivering pipe and bedding gravel. There are water trucks providing construction water to the project. There are a few whacker-packers for compaction; there are even a couple of Bob-cat style loaders, presumably to assist with some lifting aspect of the work. But, primarily, the work is conducted with shovels and an enormous effort of physical stamina, brute strength and human power. Does a project of this scope cause a bit of havoc in the neighborhood? Well, yes. There is no difference there. The major streets are closed or restricted with traffic forced onto the laterals. The number of “close calls” between vehicles and bicycles, scooters, pedestrians and the numerous horse-drawn carts, increases exponentially. 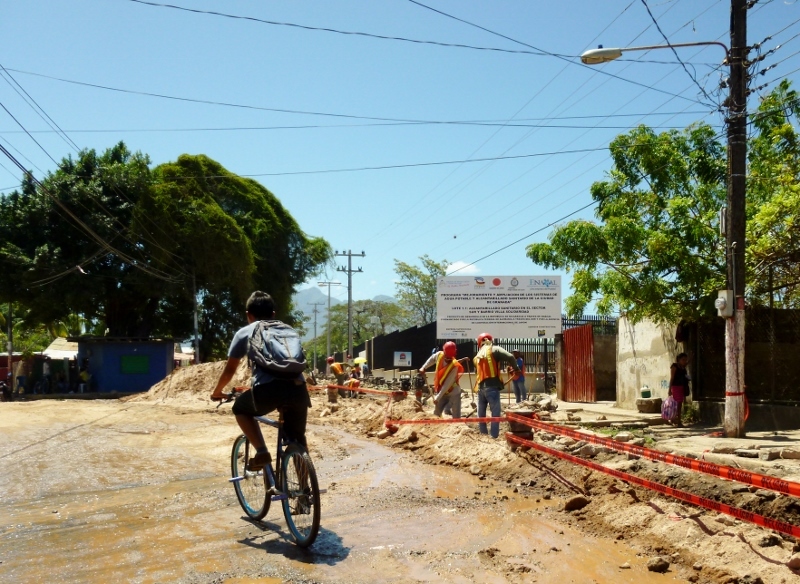 Street traffic gets diverted to the unpaved side streets creating hovering dust clouds for the residents. Traffic control, a discipline that has not yet reached its maturity in Granada, is inadequate – signage and traffic flow is a matter of secondary or tertiary importance. But the work does get done. From our seats in the taxi we click our camera shots and watch as the project unfolds. 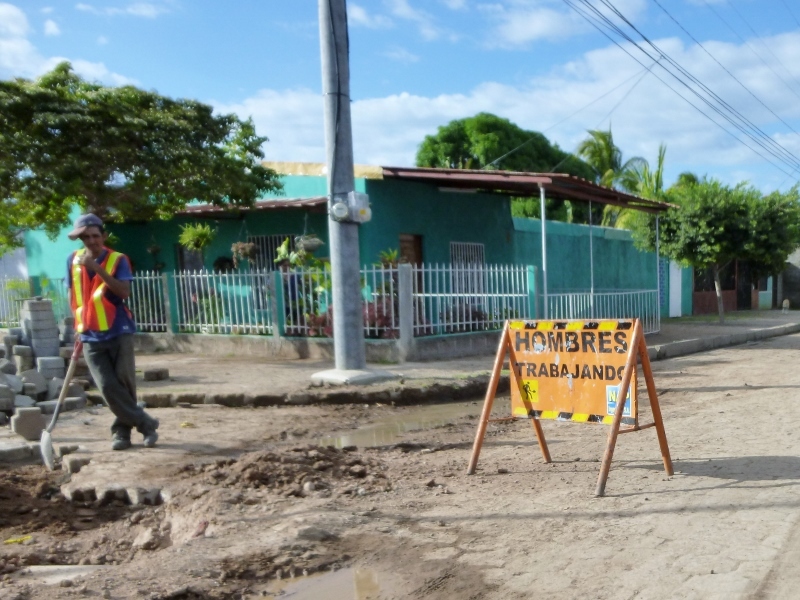 The route to our school in the Pantanal neighborhood seems to change regularly as portions of the road are released for traffic. There is no major fan-fare about the progress of the work; it simply proceeds, day after day. The only sign, while not announcing Your Tax Dollars at Work, does explain that this new work was made possible with assistance from Germany and Japan. 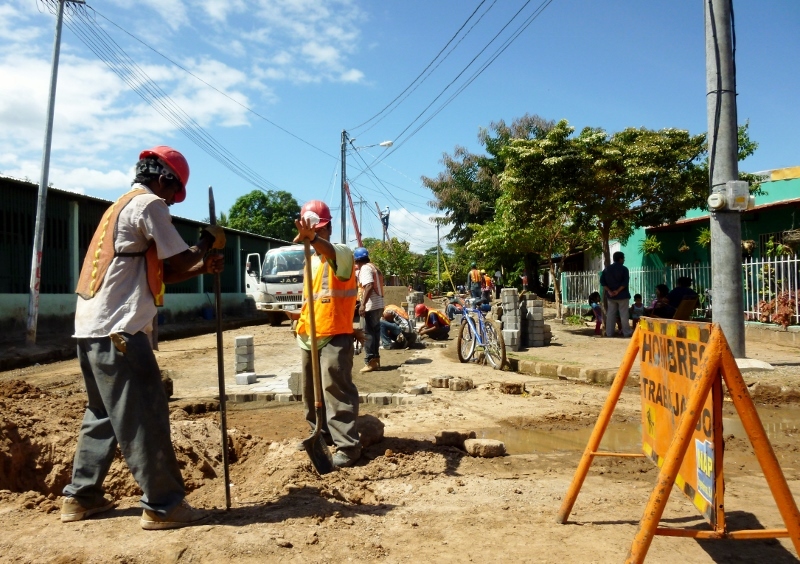 So, say what you will about the disparity of construction methods between the US and Granada, Nicaragua. 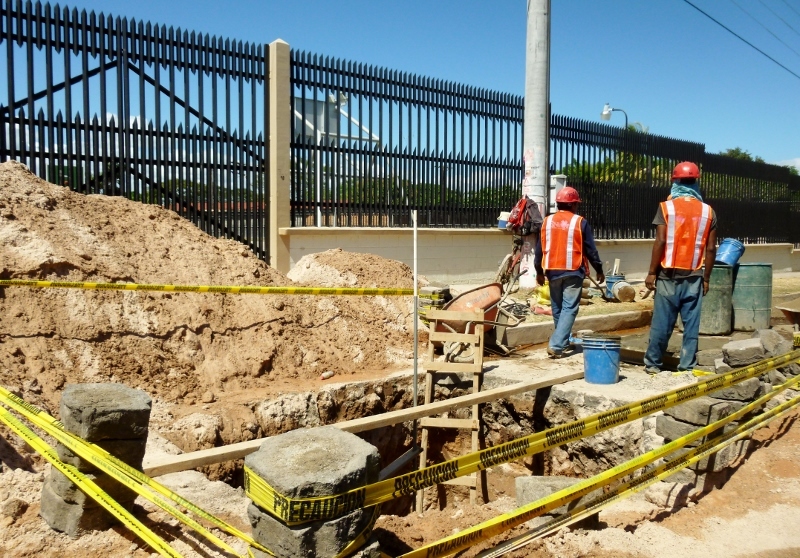 There is still a basic and unmistakable commonality – those damn construction guys are forever leaning on their shovels! Hi Terri, We’ve been taking pictures during our travels of several different construction projects and road repair sites as well as the sewer expansion project. What we find so amazing is how little machinery is used – oftentimes it seems that a hammer, a shovel and maybe a ladder is all that’s needed (oh, and a lot of strong backs!). Anita P.S. Loved your last post with the amazing photos in Guanajuato! Beautiful! Thanks Jim. Sewers, while not pretty or glamorous still deserve a little attention from time to time! Thinking of you today because the sun was bright and the weather was lovely, almost like a Granada day. 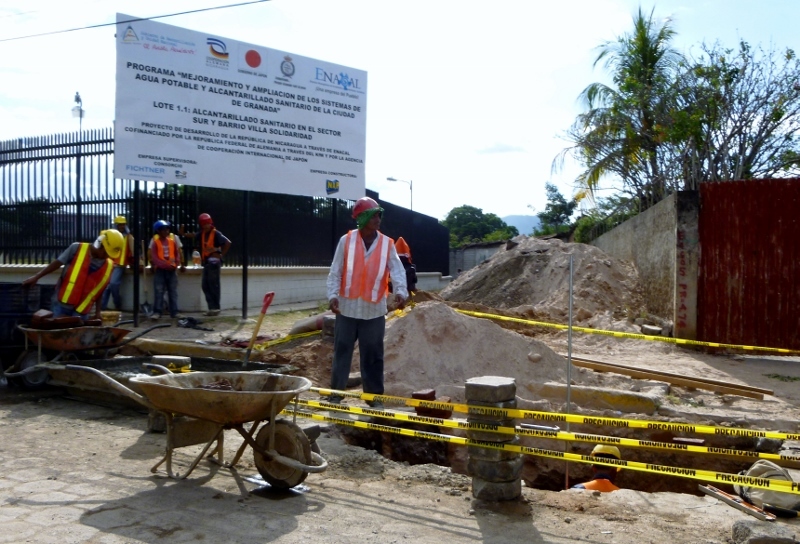 So much progress since I have left: the building beginning for the new school and sewers for the good life. My heart goes out to you for all the inconveniences. What troopers you two are. I am in the process of making a DVD for my class in LIFESPAN this summer. I’ll forward my collection of memories when completed. Thanks, Maida. As you know, things move a lot more slowly here, but, progress is a-coming! We’ll look forward to your stories when you finish them Keep warm!.